Bounded by the Baltic in the North, the Oder in the East, the Elbe in the West, the lower Havel in the South West and the Spree-Oder Canal in the South East, this region is probably one of the largest cruising areas in Europe. Well over 2,700 km of interconnected lakes, rivers and canals form an inexhaustible, dense network of navigable waterways of differing sizes. Most of them are located in the Länder of Berlin, Brandenburg and Mecklenburg-Western Pomerania, one of the regions of Germany which is most steeped in history, whether it’s the history of the Hanseatic League, the noble Junkers of Western Pomerania, the Prussian kings or the influence of Dutch princesses and craftsmen. Russian and French cultural influences can be observed everywhere – even Vienna has a share in it. The result is a region with unparalleled variety and diversity in terms of art and history. The route is lined with big cities such as Berlin and Hamburg, as well as medium-sized towns such as Lübeck, Rostock, Stettin, Oranienburg, Potsdam, Brandenburg and Magdeburg. Art lovers seeking cultural diversity will feel right at home here. Take Potsdam as an example, where the influence of the Dutch and Russian colonies is particularly in evidence, even today. If you are interested in history, you need only follow in the tracks of Humbolt or “Old Fritz” (Frederick the Great) to Sanssouci palace. This has continued into most recent German history, as witness the Potsdam Conference in Cecilienhof Palace or Templin, the municipality in which the current German Chancellor, Angela Merkel, was married. Those interested in literature are warmly invited to visit Theodor Fontane or Kurt Tucholsky. But it’s not only these luminaries of German literature who can be found here. Museums, art galleries and major collections give way to small art studios, so that you can for example watch an artisan blacksmith or string instrument maker at work in the citadel in Spandau. There are also many aspects of regional history, which children and young people in particular find especially different and interesting. Examples include the inland waterway museum in Zehdenick and the Ziegeleipark industrial museum in Mildenberg. Now 80 years old, the Niederfinow boat lift is a special technical miracle of German engineering and has to be experienced. By contrast, you will find large expanses of unspoilt nature, where you can see herons, cormorants, ospreys, cranes, storks, ducks and great crested grebes, as well as kingfishers, in their natural habitat. Besides the large number of birds, you may also catch sight of rarer animals, such as beavers, otters, muskrats, bison, frogs, etc. Also worth a visit, especially for children and young people, is the Müritzeum in Waren, an excellent visitor centre featuring native fauna and flora. You can go for a dip or while away the time in dreamlike, tranquil anchorages. The canals and rivers are lined by a variety of small towns, where you can stroll, shop and stop off for a while. An impressive range of restaurants have become established in this area, which treat customers with local dishes. Of course, Berlin also offers a wide diversity of cultural, historical and natural features. A detailed description is beyond the scope of this report. We set forth from this fantastic landscape to explore new shores. We had investigated the Lake District after many years and the same applied to Berlin. 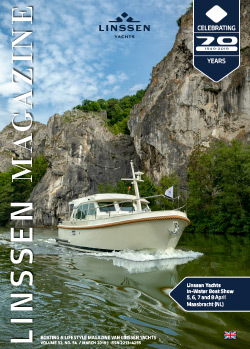 We now wanted to test Category B on our Linssen 43.9AC “La Cabaña and visit the Baltic. We covered the route from Zehdenick along the Mälzer canal and the Voss canal to Berlin in a few hours and then headed east to the boat lift. We found a nice spot at Marienwerder Marina with Sabine and Lutz Biller when Lutz probably wanted to see whether the crew of La Cabaña could actually control the boat and allocated us a very nice spot right at the back corner. He then watched the manoeuvre very closely with a benevolent eye. As he didn’t say anything more, we think he was probably happy. We also thought that we had performed our task well. So we treated ourselves at the marina’s bistro. After a wonderfully peaceful night and a hearty breakfast on board, we set off for the boat lift. The passage was uncomplicated but, as so often, a great experience. We shared the lock with two passenger vessels, which didn’t cause any problems in the large basin. The temperature had risen mercilessly and it felt like 40°C under the tarpaulin, but we couldn’t escape it in the scorching sun. So we opened all the windows we could and we stepped on the gas to produce an air flow. In Oderberg that evening, the neighbours must have thought us a strange crew as we were all below deck in the saloon. Of course, they couldn’t have known that we had an excellent air-conditioning system down there. This cooled the two cabins as well as the saloon, which was very important in ensuring a refreshing sleep. A number of bigger vessels were moored with us in Oderberg, all of which - except one - gradually sailed out the following morning. Finally, we were ready, with the water tank full and batteries charged, everything OK. Temperatures promised to be high that day as well. The water level reports for the Oder were giving rise to concern in the dry summer, which is why we decided to use the Hohensaartener-Friedrichtaler canal. Considering it’s a canal, the journey is surprisingly attractive. There are low embankments to the right and left of the canal, which allow a view of the countryside beyond, with the floodplains of the Oder on the east side and farmland and forest on the west side. There we discovered large tobacco plantations, which surprised us a lot, a little industry, both old and new, and small but inviting villages. Our destination was Schwedt, which we reached in about four hours. On offer were a small sport marina, which was not deep enough for us, and a bigger pleasure craft marina, which provided a fine mooring. It was any easy choice. This marina was another surprise. It was really well cared-for and housed ultra-clean toilets and showers in an architecturally humorous building and had another nice bistro with a very pleasant all-rounder in charge. Besides the bistro, she was also responsible for the caravan park, the marina, selling shower coins, etc. She was cheerful and helpful despite being very busy. The usual, informative talk on the landing with Oder travellers did provide us with some information which we were able to use later in our trip. However, my desire to obtain a Polish flag as the host country flag remained unfulfilled. We again had to cool the boat to a level that allowed comfortable sleep. After a delicious dinner and a glass of good red wine, we were ready for bed. We were especially looking forward to our next destination, Szczecin. We had heard widely differing reports on the mooring options in Szczecin and were therefore eager to find out the truth. The marina in the centre of Szczecin was highly praised in the legend on our map but we had read and heard criticism elsewhere and so were not convinced. A marina a little further north at the terminus of a tram line was commended, so we went there. Wonderful water meadows accompanied us on our way to Szczecin. The inevitable industrial plants on the outskirts of Szczecin were followed by prominent and very busy docks and shipyards. There was a lot of traffic there. Then came the skyline of the city, with some magnificent buildings and two bridges which were so low that we had to lay not only the mast but also the tarpaulin completely flat. This occupied so much of our attention that we failed to see the city port on the east side of the West Oder. We therefore continued on our way, past more shipyards, until we reached Goclaw marina. The marina is small, clean and has everything you would need, even though parts of it are still very basic. The best thing about it is the small supermarket on the opposite side of the street and the tram station. The staff were particularly friendly, even though they spoke no German at all, which came as a bit of a surprise to us. Using a mixture of English and sign language, we were able to ask them everything and also obtain correct answers to all our questions. I managed to obtain a Polish host country flag from another German boater. The next day was reserved for Szczecin. In the morning, we took the tram into town. We caught an older model, i.e. we arrived in Szczecin half an hour later as if shaken (not stirred!) in a cocktail shaker! Our stroll through the city led us to St. John the Evangelist church, a wonderfully light building with a very beautiful but somewhat unusual organ. One striking building turned out to be the former castle of the Pomeranian Dukes. It was still blisteringly hot, so we dropped by the small café in the Münzhof courtyard in the castle for a coffee and water. Today, the castle is used for music and art and as a museum and science centre. While we were sitting in the courtyard, we listened to a pianist who was already very proficient in his art. This is also where the tourist information office is located. We then headed for the Haken Terrace, which our guide book boldly claimed is one of the most beautiful terraces in Europe. We couldn’t wait to see it and have to admit that it is very beautiful. The view is magnificent. It’s about 500 metres long and about 20 metres above the Oder, thereby providing a great view over this part of the city. Behind us was a series of beautiful old buildings, including the Maritime University, the Vovoidship office and the National Museum. In the shadow of these historic buildings, on the Haken Terrace, we found a beautifully situated restaurant (Columbus) where we sat in the front row eating our lunch. Top quality and reasonable prices, including a breathtaking view, was our final verdict on this beautiful spot. From there we then saw the massive marina which we initially missed. It was eerily isolated. There was not a single yacht among the estimated 120 moorings!!! The area around the marina was not exactly chic either and it was extremely awkward to gain access to the city on the other side of the river. We planned to poke our nose into the marina on the return journey. But we wanted to continue on our way. We proceeded north on the Oder, passed the entrance to Dabie Lake and took a second decision to come this way on the return journey. Further north, the waterway forks into the Oder and the Policki Canal, but we stayed on the Oder. It went on and on. The floodplains of the Oder appeared lush green when flooded, sometimes with old trees and sometimes with tall shrubs or reeds. The bird paradise seemed never-ending. Kingfishers flashed blue-green but they were so frantic that it was almost impossible to photograph them. We didn’t see any more grey heron but we did see an osprey which flew overhead but apparently wasn’t hungry. At least, it didn’t appear to be hunting. The cruise along the Roztoka Odrzánska was uneventful but we stuck to the marked shipping channel for safety’s sake. Level with Trzebiez, the riverbank retreated further and the great Haff showed us its most beautiful aspect. Because of the very good visibility, we were able to see the tall navigation signs (Brama Torowa 4 - 1) from a distance. At wind force 4-5, we were also subjected to a heavy swell but this hardly had any effect on our 20-tonne Linssen. Our thoughts were directed towards the marina we should head for and we decided on Uekermünde, which we did not regret. We received a warm welcome at SSC Vorpommern. Dinner at “Backbord” was delicious, the prices reasonable and the atmosphere great. We were grateful for the always refreshing breeze as the heat continued unabated. When we wanted to start the air conditioning, the shore power had a relatively low rating (6 amps), which was insufficient for the air-conditioning unit. We briefly switched on the generator to cool down the yacht and then went to bed. The next morning, we decided to spend a quiet day in Uekermünde. We had not definitely planned our next destination. We had planned to call in at the marina at the entrance to the Peenestrom but made such good time that we decided to keep going. We continued north along the Peenestrom through the Moderort channel. Even our Linssen was now being tossed about in the wind, so we chose Rankwitz as our destination port. This was an excellent decision, as we can only recommend the charming harbour. Besides two very good pubs, there is a fishmonger that sells fresh and smoked fish. Added to the beautiful port and the overall ambience, five pleasant holiday homes are situated right next to the port. It’s a fine example of a successful port development. Our cruise continued, via Wolgast, into the Peenestrom. The entrance is somewhat industrial, which made us happy. There would be beautiful countryside again further north. The wind was now blowing at force 8 and all the locals were complaining that they had never before experienced so much wind so many days in a row. Kröslin was then our last port of call, a wonderful, very well kept marina opposite Peenemünde. Boat trips are run from here on a small passenger vessel. A day trip to Wolgast revealed a medium-size industrial town with the problems that sadly still persist in former East Germany, such as young people leaving. In Kröslin, our travelling companions met acquaintances they had not seen for years, which resulted in a pleasant, convivial chat on board under the tarpaulin in gale-force wind (with gusts of around 7 on the Beaufort scale). As the weather forecast was still issuing storm warnings, we had to abandon our actual destination of Greifswald and content ourselves with the fact that we had ventured into the Baltic. We now headed south in bright sunshine but still facing heavy winds. As intended, we then turned, a little to the north of Szczecin, into Dabie Lake to experience an idyllic landscape. It is uniquely beautiful. We took our time and, towards evening, looked for a port that would do justice to this landscape. We found a dream spot in the HOM marina at the south-eastern extremity of Dabie Lake. One reason was a Pole who spoke very good German and helped us with the formalities, but during this time a beautifully restored motor yacht arrived and moored behind us. The owner was Polish, based in this port and unbelievably proud (rightly) of the yacht he had restored. Our Polish hosts removed the benches from the rustic table standing on the jetty and replaced them with comfortable garden chairs to make things more pleasant, another extraordinary sign of hospitality. I would like to conclude the report with this port. The return trip to Zehdenick was uneventful. We arrived there four days later safe and sound and full of new impressions.